The visual imagery of Neolithic Britain and Ireland is spectacular. While the imagery of passage tombs, such as Knowth and Newgrange, are well known the rich imagery on decorated portable artefacts is less well understood. How does the visual imagery found on decorated portable artefacts compare with other Neolithic imagery, such as passage tomb art and rock art? How do decorated portable artefacts relate chronologically to other examples of Neolithic imagery? Using cutting edge digital imaging techniques, the Making a Mark project examined Neolithic decorated portable artefacts of chalk, stone, bone, antler, and wood from three key regions: southern England and East Anglia; the Irish Sea region (Wales, the Isle of Man and eastern Ireland); and Northeast Scotland and Orkney. Digital analysis revealed, for the first time, the prevalence of practices of erasure and reworking amongst a host of decorated portable artefacts, changing our understanding of these enigmatic artefacts. 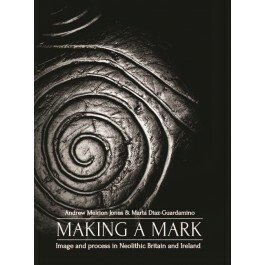 Rather than mark making being a peripheral activity, we can now appreciate the central importance of mark making to the formation of Neolithic communities across Britain and Ireland. The volume visually documents and discusses the contexts of the decorated portable artefacts from each region, discusses the significance and chronology of practices of erasure and reworking, and compares these practices with those found in other Neolithic contexts, such as passage tomb art, rock art and pottery decoration. A contribution from Antonia Thomas also discusses the settlement art and mortuary art of Orkney, while Ian Dawson and Louisa Minkin contribute with a discussion of the collaborative fine art practices established during the project. 1 The arts of Neolithic Britain and Ireland?